The Geluk or Gelug (Wylie transliteration: Dge-lugs, Tibetan:དགེ་ལུགས་པ་)school of Buddhism was founded by Tsongkhapa(1357-1419), a philosopher and Tibetan religious leader. The first monastery he established was at Ganden, and to this day the Ganden Tripa (Dga’-ldan Khri-pa) is the nominal head of the school, though its most influential figure is the Dalai Lama. 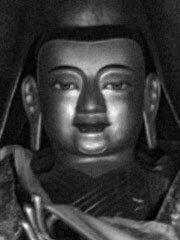 A great admirer of the Kadampa (Bka’-gdams-pa) teachings, Tsongkhapa was an enthusiastic promoter of the Kadam School’s emphasis on the Mahayana principles of universal compassion as the fundamental spiritual orientation. He combined this with a strong emphasis on the cultivation of in-depth insight into thedoctrine of emptiness as propounded by the Indian masters Nagarjuna (2nd century) and Candrakirti (7th century). Tsongkhapa said that these two aspects of the spiritual path, compassion and insight into wisdom, must be rooted in a wholehearted wish for liberation, all impelled by a genuine sense of renunciation. He called these the «Three Principal Aspects of the Path», and suggested that it is on the basis of these three that one must embark on the profound path of Vajrayana Buddhism. The Geluk sect is the only Tibetan sect that insists on the celibacy of its clergy. The central teachings of the Geluk School are Lamrim, or the «Stages of the Path», based on the teachings of the Indian master Atisa (circa 11th century) and the systematic cultivation of the view of emptiness. This iscombined with the deity yogas of Highest Yoga Tantra deities such as Guhyasamaja, Cakrasamvara, Yamantaka and Kalacakra, where the key focus is the realization of the indivisible union of bliss and emptiness. By the end of 16th century, Geluk had become the most dominant school of Tibetan Buddhism, amidst strife amongst sects of Buddhism, (and particulary the forcible converting to Gelug of the Jonang branch of the Sakya school), and from the period of «The Great Fifth» in the 17th century until the Chinese takeover in 1949, the Dalai Lamas held political over central Tibet.